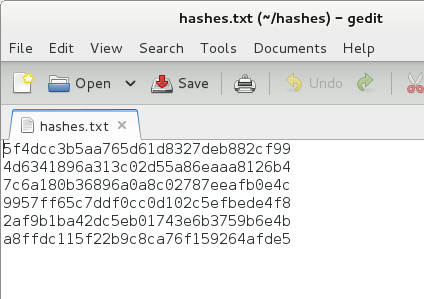 This organises a hashes directory for you, and a hashes.txt file which will contain the hashes to be cracked. Hashes.txt is the file of password hashes to be cracked – we’ll create hashes to paste into this file. 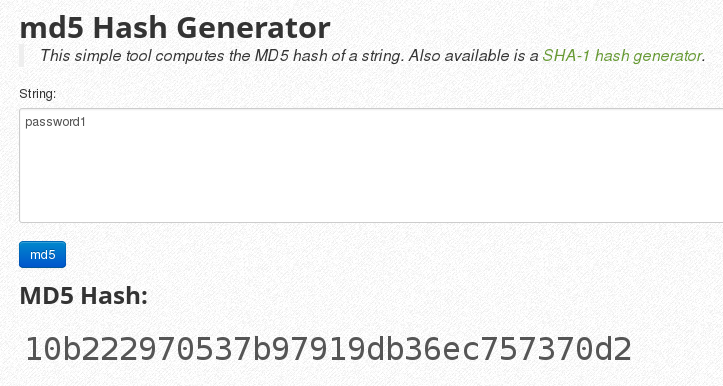 Next, hash a second password ie “password1”, paste the md5 hashes into hashes.txt. 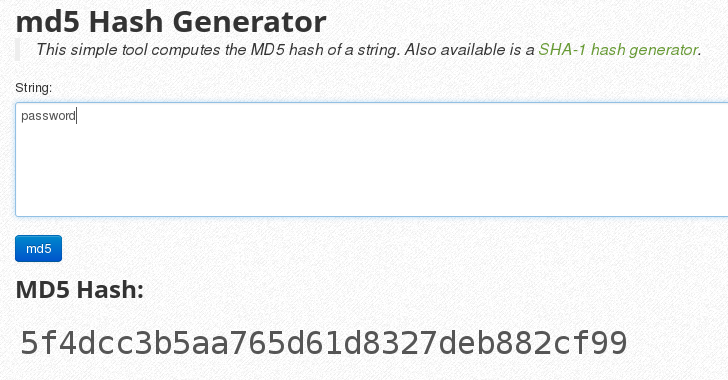 Fill up your hashes.txt with five test md5 hashes. This is your test hash file complete. Now we move into attack mode. Hashcat options. Jump to step 4 – to attack. 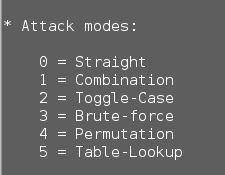 This is background information so that you can adapt your attack for windows hashes or unix hashes etc. (Carries out a straight through attack against MD5 hashes using the rockyou dictionary). I’ve found that straight or -a 0 is ridiculously fast on simple passwords. The operating system determines the hash used. You need to know the hash type. The hashes are shown – with the plain text password given next to it. The Rockyou database has several million passwords, but if it’s not in there, then it won’t be cracked. The 2 major cracking dictionaries are Rockyou, and CrackStation. Rockyou contains 14 million unique passwords. CrackStation. For MD5 and SHA1 hashes, there is a 190GB, 15-billion-entry lookup table, and for other hashes, they offer a 19GB 1.5-billion-entry lookup table. Some hashes will fail to be cracked, this is due to several reasons, it may not be a md5 hash, it may not be in your password list etc. Hashes are case sensitive, so Password1 is not the same as password1. oclHashcat-Plus uses your GPU rather than your CPU to crack passwords. Graphics cards are MUCH faster as an attack tool, than a CPU… MANY times faster. A very helpful article brilliantly illustrated. You can find a new sorted & uniq dictionary list for hashcat && jtr. DCHTPassv1.0 is available. Check it out and Enjoy! /root/rockyou.txt: No such file or directory. If you search for the standard location of the rockyou dictionary, you’ll find the original path on Kali. *rockyou*. * – and it’ll reveal the full path. As I’m lazy, I copied the file over to /root/rockyou.txt. that’s so the rockyou dictionary is always easy to find. Sorry if I caused you any confusion. Am Doing the attack right because it doesn’t seem to be recovering any passwords from the hashes! Thanks for your help, i am fairly new with all this but am super intrigued! thanks again. Try making up your own hashes file for easy passwords like password, password123. 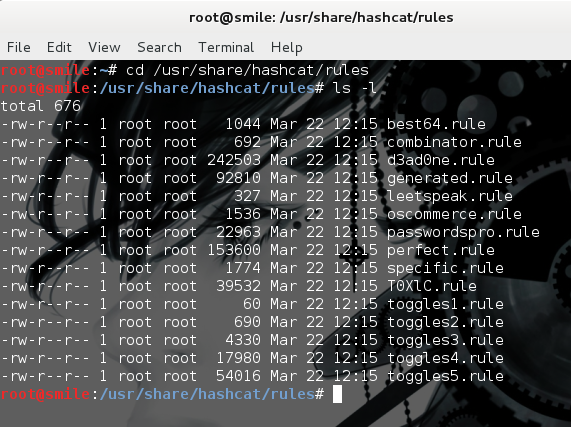 Then run hashcat against these easy passwords to get a feel for how the system works. 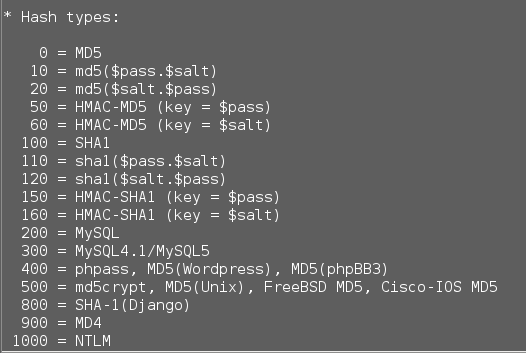 Use the MD5 hashes from http://www.miraclesalad.com/webtools/md5.php to create your md5 hashes file. Good luck! 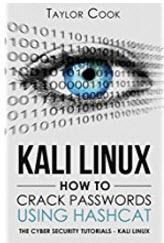 Password cracking is very addictive – so you’ll have lots of fun. when i locate *rockyou* , it tells me that the file is the /usr/share/hashcat/rules/rockyou-30000.rule so i figured thats where i should execute the attack from however it seems to load all 5 hashes, but doesn’t seem to run. This is what happens when i run the attack. Am i doing everything correct and maybe its my virtual kali machine that is installed improperly? Anyway to re install it from scratch? Hi uwnthesis, I was able to crack the hashes! What a relief and great feeling! I am now looking at hacking wireless networks but do not have a wireless card or adapter. I am running kali linux via virtualbox on a macbook air. I am curious what your recommendation would be for a wirless adapater? I have been reading a lot on the Kali forum but have found it fairly confusing! I want to be able to just plug in the adapater and enable monitor mode so i can scan for networks! Thanks again for your help uwnthesis, you are the best! Cracking Wifi is great fun. The first rule is to use a wifi adapter that is compatible with Kali. Most hackers would recommended the Alfa range. You’ll need a high gain antenna to reach longer distances. You can use an Alfa paddle or 7 db gain antenna – or an Alfa adapter that has 2 antennas on it. Alfa have drivers for Kali. You need to be careful about the network adapter you select. 2. Must be capable of packet injection. The easiest tool to use is Fern for wifi hacking. It’s very easy to use. The tool I really like is Wifite – this is an auditing tool and will carry out packet injection for you. It will colour code the wifi – so you’ll know if your signal is strong enough. Transmission power is an important part of hacking. You can alter the country code to remove regulations, eg if you set the country code to BO for Bolivia all restrictions on transmission power would be removed. The easiest way to hack is to use Fern, and go for WPS cracking to start off with. Thank you so much for the reply! I will let you know if I encounter any problems along the way! The “bunny ears” adapter – one of my all time favourite adapter. Sorry no, this can’t carry out packet injection – which is what you need to hack wifi. But the bunny ears adapter is a very good, fast, and stable network adapter. This alfa adapter is *very* old, but it was one of the best adapters. Selecting the right adapter is a very important step. Get the wrong adapter and all the hacking tools will fail on you. You might be able to get a second hand AWUS036H to experiment with thats very cheap. But it’s only 54 mpbs. It will be very limited and old school, however this was an amazing adapter for Kali – a legendary network adapter to be honest, as it picked up so many networks. Thanks again for your help in finding the right adapter! I am in Canada so that one does not ship to Canada! But I managed to find 3 on amazon.ca 😉 Here are the three that seem similar. let me know which one you recommend! Are you able to get this adapter locally? Every 3db is a doubling in signal strength. So 7 db or 10 db is a *big* different in picking up wifi – the 7db paddle is often used for war driving. The 10 db antenna is great for using in hostile environments – even got it working inside a giant faraday cage. Wifi hacking is amazing fun – and you’ll get to use all these skills in the workplace too. As I’m in Canada , the one you recommend doesn’t ship to Canada! Here are 3 alternatives that I think are similar to the one you suggested! No problem with helping! I’ve been exactly where you are.. and opted for a more expensive wifi adapter – which totally failed. Hopefully I can guide you, so that you don’t waste any money. The key to wifi hacking is the chipset inside the wifi adapter. Alfa adapters continue to dominate Pen Testing in 2015. Here are the top Kali Linux compatible wireless USB adapters with links to Amazon and AliExpress if available. The AWUS036H is where I started – it’s a great adapter, but showing it’s age. It’s only a G adapter, and ideally you need an N adapter. Most routers these days are n type routers. So you’d want to go for an adapter that can attack them. Don’t buy anything related to signalking – its’ useless! Here’s another link that details the chipsets used. So the conclusion seems to be the newer AWUS036 NHA is the best at packet injection at the moment. The AWUS 036 NHA is demonstrated to detect more networks – and to work with weaker signals. Thank you so much for your help! Looks like I have a bit of homework before making a purchase! Will let you know which one I go with! Once I receive it, I’m sure that Ill be reaching out! Yay! It’ll be great to hear how you get on. You asked great questions, so you’ll be superb at pen testing. Hi uwnthesis! I just recieved my ALFA AWUS036NH. Very excited to get started! Having some issues early on though. The first being that I run a macbook air with cd/dvd drive so that makes it difficult to install the adapter! Do you know of anywhere that I can download the driver utility software for a mac running El Capitan? Thanks! If you also know of an excellent guide to get started with Wi-Fi hacking, please send me the link! Hope to be in touch soon! Thanks for your help. Wifi cracking is such fun. Hii, would you be willing to crack this hash for me? I’ve tried this as an MD5, SHA1 and an NTLM hash as its not that. Any idea what type of hash it is? they will decrypt your hashes for free. https://forum.hashkiller.co.uk/topic-view.aspx?t=12255&m=94981#94981 – but make sure that you change your password straight after. I’m pretty sure that your password was not hashed using MD5. Any idea of the correct hashing algorithm?